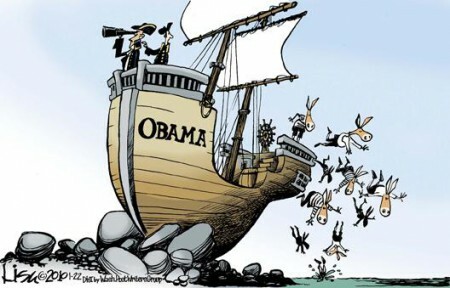 The rats are jumping ship. Two more Democrats told reporters that they will not attend the DNC Convention this year. Vulnerable Democrats looking to distance themselves from President Obama have found an easy way to bolster their independent bona fides: just skip Obama’s big party. At least half a dozen Democratic officials have said in recent days that they won’t attend the Democratic National Convention this September in Charlotte, North Carolina, where the president will formally receive the party’s nomination for a second term. The latest: New York Democratic Reps. Bill Owens and Kathy Hochul, both of whom won special elections in recent years – in 2009 and 2011, respectively – that were heralded by party leaders. “I guarantee that my time will be better spent meeting the farmers, small business owners and other people who put me here,” Hochul told The Daily today. A spokesman for Owens gave a similar explanation. “He just has a packed schedule back home,” he said. This comes on the heels of Pennsylvania Rep. Mark Critz saying he’d opt out, and a trio of West Virginia Democrats — Gov. Earl Ray Tomblin, Sen. Joe Manchin and Rep. Nick Rahall — all doing the same.